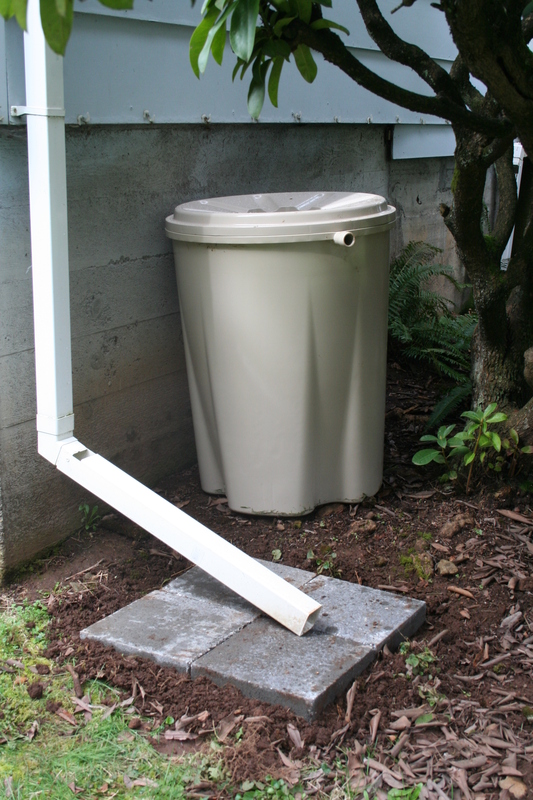 I wrote on my calendar back in February that I needed to have my rain barrel up & operational by the first of March. That didn’t happen, so I thought maybe I could at least get it out by the first day of Spring. But I didn’t count on a few details, like needing my husband to cut the down-spout to the right height. I could do it, but when you’re messing with a man’s territory it is best to let the man make the adjustments. I know Don would frown on it if I rearranged the water spout and he wasn’t home today. But I did buy some paving stones to put under my barrel, completely forgetting that I needed cinder blocks because it has a spigot on the bottom. At least the ground is level. I decided to put out more bird feeders today as well. 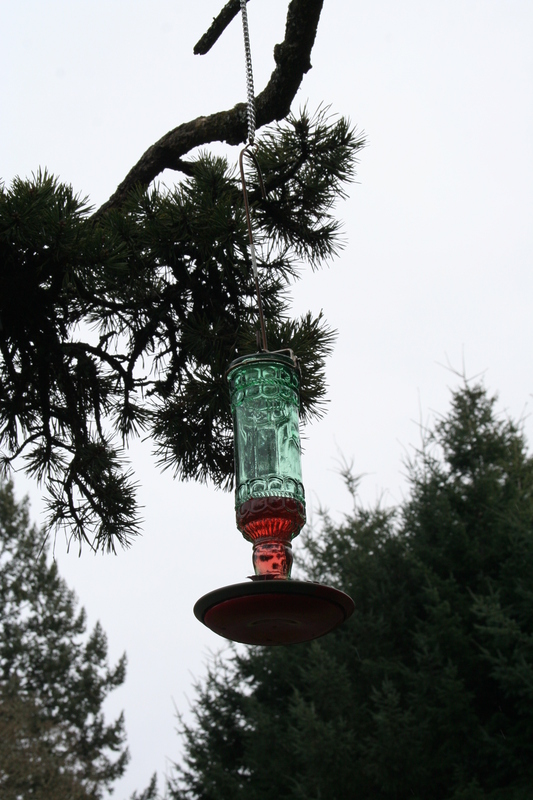 I filled the goldfinch feeder with Nyger thistle and filled two hummingbird feeders. The weather is starting to warm up and I hope to attract some colorful little birds to the yard. 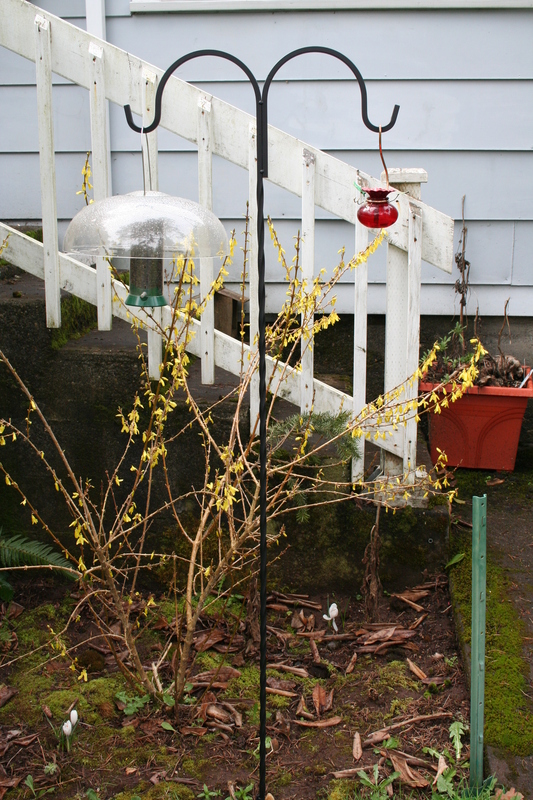 Did you notice the forsythia is opening up? I only partially filled this one because I expect the ants will find it before I get too many hummingbirds to come by. The rest of the day I bird-watched. Not exactly, but I checked out my window several times in hopes of catching the first migrating goldfinch. I did see some pretty birds and one Douglas Squirrel. I let the squirrel be: he doesn’t compete that much for the bird seed. I’m waiting on my yearly woodpecker visitor. Don’t ask me which kind of woodpecker, he does have a red dash on his head thought. He likes the bugs on my Maple tree in the front yard. I keep Monster & Shawdow inside and let them chatter at him through my office window. this only happens in the early spring before the tree gets leaves. As the world turns outside my window. You did good with your bird count. I hope the Goldfinch and Hummers show up soon to your feeders. Our earliest migrators to appear are the Common Redpolls in late February, followed by the Snow Buntings. The Tintina Trench, where we are located, is a popular corridor for migrating flocks, and it’s exciting to see the many species of birds arriving throughout April and into May. One of my favorite things about spring, for sure! Do those fat Quail count? Actually saw a skinny Robin today, though. At the edge of the Spruce tree, avoiding snowflakes.